Click the links below to view all the free phonics printables! Initial Blend Dominoes print it here! Pre-Primer Sight Word Bingo 1. Pre-Primer Sight Word Bingo 4. Rhyming Pairs: This is a set of 36 pictures to play rhyming pairs. Delightful graphics help make this is a great first game to encourage rhyming. I also use these to play a game of silly sentences with sight word flash cards. Put all the sight words face up on the floor, along with 7 or 8 rhyming picture cards. 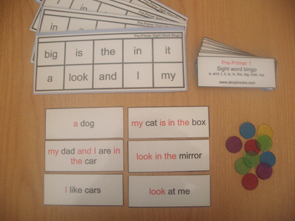 Encourage your child to make ‘silly sentences’ with the sight words and rhyming cards. Sight Word Bingo Games: These come with printed sentence strips for practice using these words in context. These are cool games and very effective. They consist of 4 progressive Sight Word Bingo games, each with 10 high frequency words and covers all 40 of the Pre-Primer sight words. Pre-Primer Sight Word Bingo 2: a, and, I, it, is, in, the, big, look, my. Pre-Primer Sight Word Bingo 2: contains the words: go, me, not, we, said, to, you, little, help, where. Pre-Primer Sight Word Bingo 3: contains the words: can, find, here, yellow, run, see, red, one, for, up. Pre-Primer Sight Word Bingo 4: contains the words: away, blue, come, down, funny, jump, make, play, three, two.